Once known as “The Most Remote Village in the British Empire”, Bario is reachable only by plane unless you are a very brave jungle trekker. But once there, you can enjoy one of the best food festivals in Borneo. By Stacy Gregory. KUCHING, 14 March 2018. Dreaming of being able to jet off somewhere quiet and peaceful for the weekend of 26-28 July? Wanting to be off the grid and rejuvenate – and eat? Consider this little piece of heaven, tucked away in between Tama Abu Range and Apo Duat Range on the Sarawak-Kalimantan (Indonesia) border, on the island of Borneo. It’s a hidden paradise with no connection to any fast-paced technology that we are so used to. And that makes it the perfect place for you to reconnect with mother nature, so, abandon your gadgets and get your body and mind ready for an adventure. Culture, dancing, healthy air, happy families. Bario is the definitely one of the best food festivals in the region. Courtesy Stacy Gregory. Getting there is an adventure in itself; the only (sane) way to get there is by 16-seat aircraft run by MASWings (the only carrier). Because it’s the main lifeline for Bario, the DHC6 Otter from Miri is often half full of bags of rice, tinned foods, home appliances, sacks of sugar and boxes of stores – all piled on empty seats, along the aisle, and anywhere there is a gap. Taking the road is only for the very brave – it’s at least 24 hours by 4WD through forest tracks. 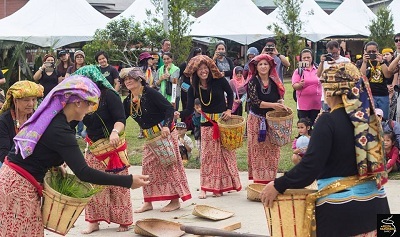 The local people of Bario, the Dayak Kelabits, have been running the Bario Food Festival, locally known as Pesta Nukenen, for several years now. This year, from the 26th-28th July, the Kelabits will be showcasing their tradition and culture through dance, singing, fun activities and of course, their glorious food. This is all for free! The people of Bario say the festival is run for the world to experience and to get to know the beautiful people there. From their colourful costumes, healthy food made from nature, to the chilly weather (Bario is around 1,200m high up in the mountains), to the fun physical activities for all ages, there is something for everybody even discounting all that lovely free food. Nubag Layag red rice is utterly delicious. Courtesy Stacy Gregory. 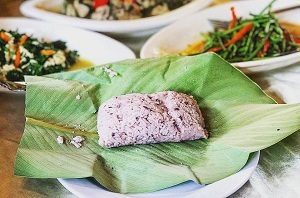 Special and tasty local dishes you simply must try when you’re there are first and foremost, ‘Nubag Layag’ - mushed home grown red Bario rice wrapped in leaf called ‘Isit’. The history of this must-have rice dish is that it was the standard food local farmers would carry with them as snacks when they had to head over to their farms. Another must-have dish that you absolutely have to try ‘Pucuk Ubek’, a delightful concoction of pounded tapioca leaves. And don’t forget the ‘Urum Ubek’, or glutinous rice fritters. The best thing about these delicacies are that they all come straight from mother nature so there are no MSG, no additives and no processing in most of the dishes. It’s not only yummy but it’s really healthy for you too. Stargazing is as good as it gets in Bario. Courtesy Stacy Gregory. Once you have satisfied your stomach, you can set out fortified for a hike to the highest and largest National Park in Sarawak at Pulong Tau, or to visit the goat farm in the day time, or for those that prefer rainforests at night, to look up at the heavens. Because of its altitude and clear remote air, Bario is one of the best places for you to star gaze. All these attractions mean plenty of organic activities that are great for both solo travellers seeking for adventure as well as a full family with young children. Getting to Bario however is not that simple; the 16-seat planes (plus that random cargo) fly several times a day, but there are not many seats so book early. They come into the high mountain airstrip from Miri, Lawas and Kuching and during the festival, MASwings increases the number to cope with extra visitors. For accommodation, Bario offers more than 18 homestays with another 10 or so not that far away from the centre. The average rate per night during the festival would be about RM150 (US$38). This includes transportation from the Bario Airport to your homestay and usually three meals a day too. Some good ones are the Ngimat Ayu House the Bario Valley Homestay and the Sinah Rang Lemulun Homestay and Handicraft. Hand produced salt wrapped in palm leaves. Courtesy Stacy Gregory. You can usually book your stay online, or contact the operators directly. Most of the homestays also book tours for residents that offers activities from hiking to bird watching to visiting a salt factory – so you can customise your activities to what fits you, your budget and fitness level. With just enough infrastructure to cater for the necessary basic needs of tourists - and the people - Bario is truly a piece of heaven on earth, with food to match. Oh, and by the way, because you are getting away from the rat race, and also possibly eating too much as well, the only way to get around is by walking or riding a bicycle. But however you travel, the people in Bario are some of the friendliest you will ever meet. See you at the Bario Food Festival 2018!